Netherton syndrome (NS) is a rare autosomal recessive skin disease with severe skin inflammation and scaling, a specific hair shaft defect and constant allergic manifestations. NS is caused by loss-of-function mutations in SPINK5 (serine protease inhibitor of kazal type 5) encoding LEKTI-1 (lympho-epithelial kazal type related inhibitor type 5) expressed in stratified epithelia. 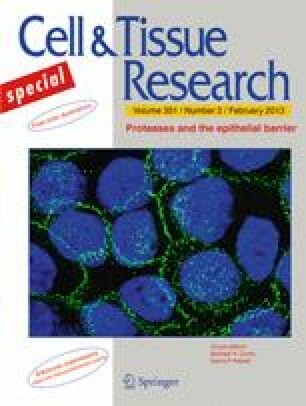 In vitro and in vivo studies in murine models and in NS patients have cast light on the pathogenesis of the disease and shown that LEKTI deficiency results in unopposed kallikrein-related peptidase 5 (KLK5) and KLK7 activities and to the overactivity of a new epidermal protease, elastase 2 (ELA2). Two main cascades initiated by KLK5 activity have emerged. One results in desmoglein 1 degradation and desmosome cleavage leading to stratum corneum detachment. KLK5 also activates KLK7 and ELA2, which contribute to a defective skin barrier. This facilitates allergen and microbe penetration and generates danger signals leading to caspase 1 activation and the production of active interleukin-1β. In parallel, KLK5 activates a specific cascade of allergy and inflammation by activating protease-activated receptor-2 (PAR-2) receptors. PAR-2 activation triggers the production of the major pro-Th2 cytokine TSLP (thymic stromal lymphopoietin) and several inflammatory cytokines, including tumour necrosis factor-α. Levels of thymus and activation-regulated chemokine (TARC) and macrophage-derived chemokine (MDC) also contribute to allergy in a PAR-2-independent manner. Patient investigations have confirmed these abnormalities and revealed a wide spectrum of disease expression, sometimes associated with residual LEKTI expression. These results have demonstrated that the tight regulation of epidermal protease activity is essential for skin homeostasis and identified new targets for therapeutic intervention. They also provide a link with atopic dermatitis through deregulated protease activity, as recently supported by functional studies of the E420K LEKTI variant. The work presented here was in part funded by the Fondation pour la Recherche Médicale and the Agence Nationale pour la Recherche.